COMERICA PARK PHOTO picture art print poster of COMERICA PARK OPENING DAY photo picture print for sale. 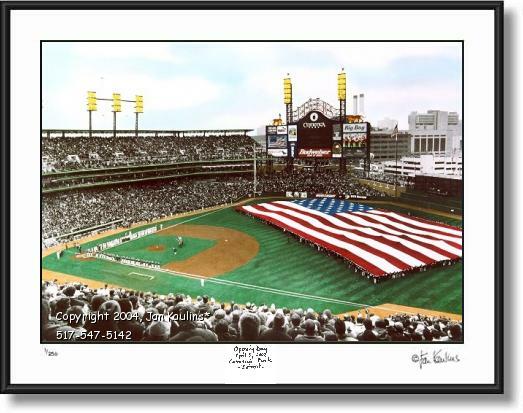 COMERICA PARK DETROIT OPENING DAY APRIL 11, 2000 photo picture print for sale. Detroit Tigers Comerica Park Opening Day photo photograph prints photography before the First Pitch with large American Flag on the field.Detroit, Michigan Detroit Tigers Comerica Park Inaugural Opening Day First Game just before the First Pitch art photo picture print for sale: This beautiful color Comerica Park Stadium photo print, which is made from AN ORIGINAL HAND-COLORED BLACK AND WHITE PHOTO, is a Detroit Comerica Park photo taken April 11, 2000, Opening Day of the Inaugural season for the new downtown Detroit baseball stadium, home of The Detroit Tigers, Comerica Park. This historic Detroit Comerica Park picture photo print features a picture of the worlds largest scoreboard and the worlds largest flag unfurled on the playing field during historic Detroit Tigers opening day ceremonies at Comerica Park on a chilly early spring day in The City of Detroit, Michigan. In this historic Comerica Park Opening Day First Game photograph taken just prior to the first pitch, is also pictured the Detroit Tigers and their oponents lined up in opening ceremonies during the first singing of The American National Anthem at the new Detroit Tigers Comerica Park baseball stadium. This is a rare and unique photograph of Comerica Park Opening Day with the world's largest flag being unfurled by the workers who built Comerica Park. This Detroit Tigers Comerica Park Opening Day photo captures a very historic event in the history of The City of Detroit and in the history of Detroit Tiger Stadium. Take a look at the OTHER Comerica Park Detroit pictures and photos including The 2005 Comerica Park All Star Game and The 2006 World Series Game Comerica Park Detroit picture and photo on this website. Also be sure to look at the old Detroit Tigers Stadium photo pictures on this website, including The Last Game at Detroit Tiger Stadium aerial photo picture. TO SEE THE MANY OTHER DETROIT PHOTOGRAPHS FOR SALE IN THE DETROIT PHOTO GALLERY, INCLUDING DETROIT AERIAL PHOTOS, DETROIT LANDMARKS, HISTORIC DETROIT PHOTOS AND DETROIT SPORTS PHOTOS, CLICK ON THE 'Back To Detroit Tiger Stadium Photo Gallery' LINK ABOVE THIS PHOTO NEAR THE TOP OF THIS PAGE OR CLICK ON THE 'HOME-RETURN TO ALL GALLERIES' LINK BELOW.